I don't frequent too many wine bars but when I do I almost always ask the bar tender what on the list is drinking good. I like to think that these guys have probably guzzled the juice on the list a few times and know what's ripping at the moment. 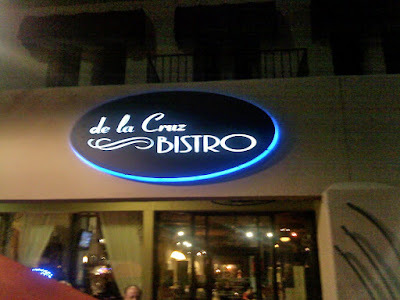 Needed to get out of my office and decided to make a stop by de la Cruz Bistro here in downtown Mesa, Az where my office is located. They had a list of reds and whites of which I was familiar with the majority of the wines but decided to give the choice to the bar tender. 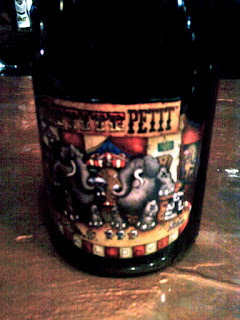 He of course recommended the 2007 Michael David Petite Petit. Now, I know the Michael David wines and have tasted this wine before but decided to give it a whirl because it came so highly recommended. Those of us who are familiar with the Michael David wines (Seven Deadly Zins, 6th Sense Syrah, 7 heavenly Chard) know that these wines tend to be fruit forward quaffers more than anything else. The color of the wine was as expected and had an over extracted, dark-purple, and quite opaque appearance. The wine is composed of 85% Petite Sirah and 15% Petite Verdot (thus Petite Petit). On the nose the wine had a bouquet of black licorice, creme de cassis liquor, and black fruit syrups. On the palate the wine continued in this form showing big jammy black currant, melted licorice flavors, and hints of dark chocolate raspberry sticks. This wine is of course very fruit driven and has a round and generous texture, with little or no acidity. Unfortunately, I've reached my limit for EC dropping. But I just wanted to leave a comment and say you have a wonderful blog! I need to work on my knowledge of wines - I am definitely in a wine rut - drinking the same four wines over and over. Part of it is budget - but part is ignorance. Subscribing. Thanks for subscribing! There are plenty of budget wines out there that you can explore. Try Trader Joe's! Joe's has all sorts of affordable wines. Thing is, a lot of them are quite insipid.